Riot Games has revealed this year’s Victorious skin, which is awarded each year to players who finish the game’s ranked season in Gold rank or higher. The skin was teased late last week on Twitter, and Riot officially showed off the new skin over the weekend. The initial tweet, which you can see below, made it pretty clear which champion was getting the new skin. It featured a robed woman standing behind a giant levitating sphere, which left players in little doubt as to which champion would be Victorious this year. Now however, they’ve shown off the skin amidst the rest of the 2018 season rewards. That’s a bit of a weird pick, for my money, as I wouldn’t say that the Lady of Clockwork has been all that impactful in this year’s meta. According to analytics site champion.gg, she’s currently sitting around halfway down the list of optimal midlaners. She’s been more popular than average, sure, but struggled to rise above a 50% win rate for the past few patches. 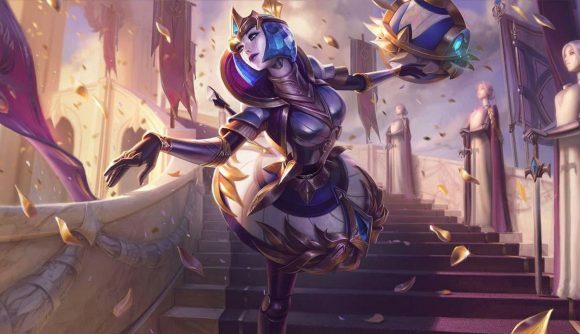 League of Legends’ 2018 season ends on November 12, so expect Victorious Orianna to arrive with patch 8.22. To earn the skin, you’ll need to make it to Gold or above in any of the game’s ranked queues. To help you in the last month of your ranked climb, check out the League of Legends patch 8.21 notes – in terms of balance, they’re reasonably slim, but they have a whole bunch of Halloween and K-Pop themed skins.